Sweet, salty and simple to make, chocolate-covered pretzels with almond bark can be customized in countless fun and flavorful ways. After melting the almond bark in the microwave, pretzel sticks get a quick dunk to coat, after which you can top with any coating you wish. Adapted from Betty Crocker’s Sweet and Salty Dipped Pretzels, a splash of coconut extract and coconut flakes give these chocolate-covered pretzels a tropical twist. Get creative with your topping choice and coat them with everything from colorful sprinkles to a beloved breakfast cereal. Lay out a large sheet of wax paper. Sprinkle a generous amount of coconut flakes onto a plate. Add the pieces of almond bark and coconut extract to a microwave-safe bowl and microwave on High for 30 to 60 seconds, pausing to stir every 15 seconds, until completely melted. 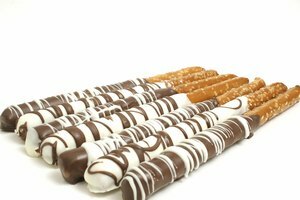 Dip a pretzel rod into the melted almond bark, coating half to three-quarters of the pretzel. Hold the pretzel over the bowl for a few seconds after dipping to let the excess chocolate drip off. Roll the pretzel rod in the coconut flakes, then place it on the wax paper. Repeat with the remaining pretzel rods. Let them set at least 30 minutes before eating. 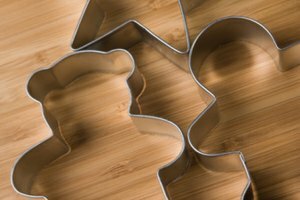 Put your own personal twist on chocolate-covered pretzels by getting creative with coatings. Sprinkles of all sizes, shapes and colors add pizzazz, as do colored sugar crystals. Or, you can coarsely chop a favorite cereal, cookie, candy or nuts in a food processor for a few seconds to use as a coating. Peanuts, cashews and pistachios add savoriness, peppermint candies provide a festive touch around the holidays, Oreo cookies lend additional sweetness and a favored puffs cereal adds maximum crunch. You can also skip the textured coatings and use another flavor of almond bark to liven up the appearance and flavor. If you chose to use a dark chocolate almond bark, drizzle thin strips of a white chocolate almond bark across the sticks to punch them up. If you'd rather not use large pretzel rods, go ahead and use smaller pretzel sticks. You can also use traditional pretzels; simply hook individual pretzels on a fork and lower them into the melted almond bark to completely coat them. Have all of your ingredients prepped and ready before you begin as the almond bark will harden fairly quickly as you dip.